Senior Medical Consultant, Obstetrics, Gynecology, Reproductive Medicine and Surgery; Clinical Professor, Department of Obstetrics and Gynecology, Creighton University School of Medicine; Director, Pope Paul VI Institute for the Study of Human Reproduction. Editor, Logos: A Journal of Catholic Thought and Culture; Visiting Assistant Professor of Catholic Studies, University of St. Thomas. Mother Agnes Mary Donovan, S.V. Dr. Malcolm C. Harris, Sr.
Fr. Joseph C. Howard, Jr.
School of the Annunciation, Buckfast, Devon, UK. Sr. Yvonne Mary Loucks, Ph.D.
President of Natural Family Planning Outreach, Inc. Associate Attorney, Devero Taus, Warren, New Jersey. Clinical Adjunct Professor, Florida State University, Daytona Regional campus. Clinical Adjunct Professors at the Florida State University, Daytona Regional campus. Alexander T. Pocetto, OSFS, Ph.D.
Dr. Ronald B. Thomas, Jr.
Board of Directors, Trivium School, Lancaster, Ma. Rev. Thomas Joseph White, O.P. Deacon William V. Williams, M.D. Chairman, St. John Neumann Chapter, Catholics United for the Faith, Philadelphia. Founder, Theology of the Body for Everyone! The symposium featured presentations by experts from the sciences, social sciences, history, philosophy, and theology. The event was cosponsored by the United States Conference of Catholic Bishops Committee on Laity, Marriage, Family and Youth, Marquette University’s College of Nursing, the Dominican House of Studies, and the John Paul II Institute for Studies in Marriage and Family. 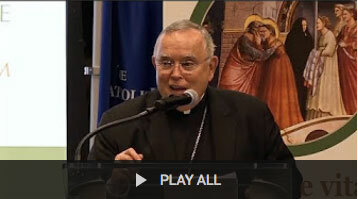 Visit our YouTube channel to watch videos from the Humanae Vitae conference. Those looking for a more extended response to the Wijngaards Statement will find it in "Self-gift: The Heart of Humanae Vitae." Additionally, click here for a bibliography of resources supportive of the Church's vision of marriage and sexuality, and of Humanae Vitae in particular. We invite those with doctoral degrees of any kind to show your support and sign the statement.